Demand side externalities - FreeEconHelp.com, Learning Economics... Solved! 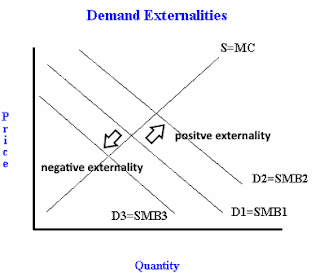 Externalities can be either positive or negative. They occur when a third party not directly involved in a transaction is affected by the transaction. For example, when someone decides to buy cigarettes and smoke them, they purchase the cigarettes from a firm (which incurs a cost and makes a profit) and then smokes them (enjoying the leisure associated with cigarette smoking). However, anyone near the smoker incurs the cost of having to breath/smell/see the smoke (which may be quite high if they are allergic). This cost to the third party occurs outside of the traditional supply and demand framework, which is why it is called an externality. Identification of the externality allows us to separate the private marginal benefit of an action vs. the social marginal benefit. Looking at the graph, we should recognize SMB1 as the original demand curve that focuses on our end user. While SMB generally means social marginal benefit, we can think of it as private marginal benefit in the following example. When this consumer smokes a cigarette, they are imposing a cost to society (on others nearby) and this cost reduces the social marginal benefit associated with cigarette smoking. This is visualized by the SMB3 curve. We can see that the SMB3 curve crosses the supply curve at a lower price and quantity, which demonstrates that the social marginal benefit is smaller than the private marginal benefit. It also shows us that the equilibrium quantity (to maximize societal welfare) is smaller than the private equilibrium if we were to ignore the externality. One way to deal with a negative externality is through a tax. By taxing the individuals causing the negative externalities, they experience a higher private cost (or lower benefit) which will reduce their consumption. 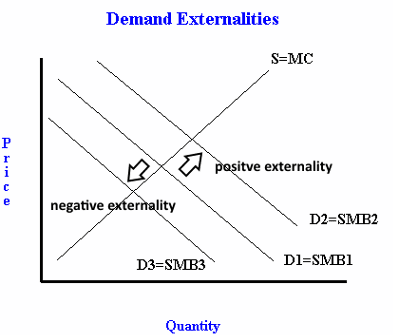 However, it is also possible for there to be positive externalities. A common example of a positive externality is choosing to pay for education (if no comparable free options are available). Studies suggest that an educated population is good for society, so individuals choosing to become educated create a positive external effect on those in their community (imagine where we would be without doctors or researchers finding cures for things). This can be visualized in the graph by looking at the SMB2 curve. It shows that the social marginal benefit is higher than the private marginal benefit. This makes sense, because when one chooses to pay for school, they generally ignore the greater effects that their education can play on society. They choose to go based on their own perceived benefit from the decision. However, we can see on the graph that the SMB2 curve intersects the supply curve at a higher quantity and price than the private marginal benefit curve. This means that we are under producing/consuming education and that in order to maximize societal welfare, we should produce more or create a subsidy to encourage the optimal quantity. I do not know how to calculate P= 21-Q, MR = 21-2Q, TC = 3+Q+Q>2, MC = 1+2Q. Candid institute Spring and Hibernate course provides a comprehensive introduction to Spring and Hibernate open source frameworks as well as Web Services and AJAX. Suitable for both Spring3/Hibernate3 and Spring4/Hibernate4, the course includes coverage of the core Spring and Hibernate capabilities, as well as the integration capabilities provided by Spring. Pretty good post. I just stumbled upon your blog and wanted to say that I have really enjoyed reading your blog posts. Any way I'll be subscribing to your feed and I hope you post again soon. Big thanks for the useful info. You put really very helpful information. Keep it up. Keep blogging. Looking to reading your next post. Thanks for taking time to share this valuable information admin. Really informative, keep sharing like this.